The Royal Ontario Museum (ROM) announced today the publication of the fifth guide in its popular series of Field Guides. 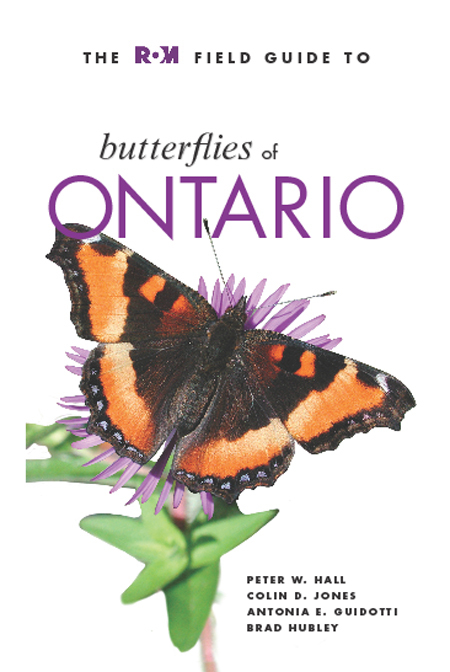 The ROM Field Guide to Butterflies of Ontario is the first comprehensive book on the butterflies of Ontario, and highlights 167 species of the most beloved insect recorded in Ontario. Written by renowned lepidopterists Peter W. Hall and Colin D. Jones and ROM entomology technicians Antonia Guidotti and Brad Hubley, the ROM’s Butterflies Guide features striking field photography, sections on the best places to observe butterflies in Ontario, and the first-ever use of computer-modelled predictive distribution maps in a field-guide. Also featured in the handy guide is a partial list of plants used by butterflies and caterpillars, and a checklist to track your sightings. The ROM Field Guide to Butterflies of Ontario is available for sale in the ROM Boutique for $29.99, and $26.99 for ROM Members (ROM Members enjoy a 10% discount on ROM Boutique purchases). The book is also available at book retailers across Canada. Peter W. Hall is a research associate with the Canadian National Collection of Insects and Arachnids. Colin D. Jones is a zoologist at the Natural Heritage Information Centre, Ontario Ministry of Natural Resources. Antonia Guidotti and Brad Hubley are entomology technicians at the Royal Ontario Museum.